©Bert Gildart: In 1865, John Wilkes Booth assassinated President Abraham Lincoln, then leaped off the balcony and onto the stage below. In the process he broke his leg but managed to hobble to the home of Dr. Mudd, who set the fractured bone. Then Booth hobbled to a barn, where he died in a blazing fire. ESTABLISHING CAMP: At the time everyone thought there was a group effort. In fact, Dr. Mudd was spared the death sentence by just one vote and instead was sentenced to spend the rest of his life in one of the most isolated prisons in the world—the prison at Fort Jefferson on Garden Key, located in the Dry Tortugas. 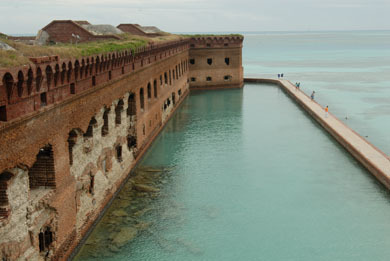 The old fort is 90 miles south of Key West, and is reachable only by boat or seaplane. Today, the 7 islands comprising the Dry Tortugas are a national park, and several days ago Janie and I left our Airstream at a KOA on Sugarloaf Key, drove 15 miles to Key West, and boarded the Yankee Freedom with our backpack gear, intending to stay an extra night at the park’s campground. There is no fresh water, no food—just sand—and people who arrive must be completely self sufficient. Essentially the island’s only visitors are the birds. We had cruised into an exotic setting, for overhead Frigate birds soared on nine-foot wings, waiting for gulls to catch a fish, at which time they’d swoop down and relieve the gulls of their catch. Waters surrounding us ranged in color from emerald green to a deep blue and into them brown pelicans dove and then gulped down their catches of fish. But in front of us loomed the fort, old and tired but still imposing and covering almost the entire island except for the small campground. DAVID & KATHY: Grabbing a cart, we joined the only other two people out of the hundred-plus passengers who had opted to camp for the night. In fact, David and Kathy were staying not just one extra night but three. David had once attended the Air Force Academy but had later opted out of the military for a life as an Iowa farmer. Kathy worked as an Elderhostel instructor and we couldn’t have asked for a more delightful couple with whom to share Garden Key. We were all interested in the same types of things, and for starters that included the area’s unique natural history and history. Ponce De Leon named the Dry Tortugas, and was inspired by the abundant turtles he saw, meaning that, when translated, we were camped in the Dry Turtles. For many years the seven islands were the hangout for pirates, but then about 1840, a young West Point graduate by the name of Robert E. Lee helped survey them and found them appropriate for a fort. 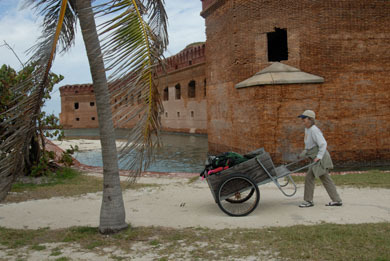 Construction on the fort began in 1846, and was conducted initially with slave labor. Three years later work on the moat began and it was completed in 1849. After that, work was sporadic, but by 1861 the fort was sufficiently complete to serve as a prison—in part for captured Confederates, but mostly for Federal soldiers who had deserted. Then prisoners began to form the work force. WALKING THE MOAT: Today, as we wandered around the old fort, we were again drawn to the beauty of the seas. Walking the moat, Janie looked into the clear waters near the wall to discover that we were in fact trailing a five-foot shark, one simply looking for food. It was a nurse shark and we were told they are harmless. Still if you’re a novitiate, any shark looks dangerous, but the snorkelers nearby kept snorkeling, despite the shark’s presence. Apparently they knew. As well as the beautiful shells and beaches and moat, we were also drawn to the boats recently used by Cuban refuges seeking a better life in America. Refuges apparently arrive to the Tortugas at the rate of one boat per week, and we scanned the horizon wondering if today might be the day one of these desperate families hauled ashore. We walked over to several of their vessels and stepped off the sizes, about 18 feet by six feet. CUBAN REFUGEE BOATS: Hulls came up to just above my hip meaning they were about three and one half feet high, which is fairly deep. Into these boats one of the rangers said families might cram 12 to 20 people, hoping then to reach America. Boats were powered by small Russian two cycle tractor engines. Whether they remain in the U.S. is part of a policy determined by a “Wet-foot dry-foot policy. If the Coast Guard stops them at sea they are returned to Cuba at night and dropped off at the relative obscurity of Guantanamo Bay. But if they manage to set foot on any piece of land managed by the United States then the “Dry-foot” policy prevails. According to that policy, refuges are then given $3,000 cash, and three years of subsistence to include full medical benefits. 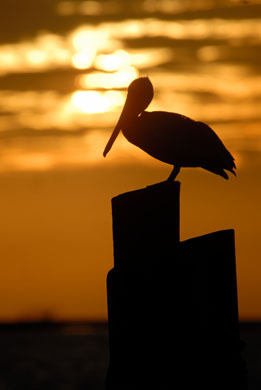 PELICAN GREETS THE SUNRISE: These were subjects that made for good conversation later that evening as the sun began to dip into the western sky. Yet another subject concerned Dr. Mudd, the park’s most famous prisoner. Next morning, we returned to his cell, believing the subliminal impressions of the previous day might have fostered nocturnal insights. Dr. Mudd began was given a life sentence here in the Tortugas in 1865. He was joined by three other men also believed to have been involved in the conspiracy to assassinate Abraham Lincoln. Their involvement was considered peripheral, but sufficient to draw a life sentence, which all began to serve on July 24, 1865. We visited Dr. Mudd’s old prison cell paying particular attention to the sign over the entrance to his cell. Who so entereth here leaveth all hope behind. Apparently conditions were harsh for on September 25th Mudd attempted to escape, but failed. In fact, the doctor might have died in the prison had it not been for an outbreak of yellow fever. Working tirelessly Mudd helped alleviate the suffering and in the process contracted the disease himself, but unlike many, he recovered. That was in August of 1867, and of the 400 people living on Garden Key, 270 contracted the disease and 38 of those died, to include Dr. Joseph Smith, the post surgeon. That’s when the post commander sought out Doctor Mudd’s services, which he rendered tirelessly. Two years later, President Johnson recognized his efforts and in 1867 pardoned him. 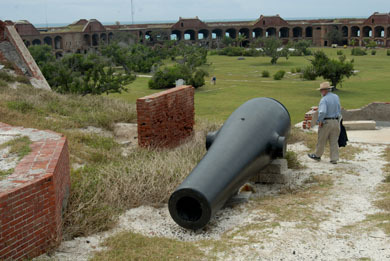 CANNONS RENDERED OBSOLETE: Dr. Samuel Mudd had been a prisoner in the Dry Tortugas for four years, and though free not all believed in his innocence. But his family did, and through the generations all have attempted to clear his name, but none more vigorously than one of his grand children. In the 1970 and ‘80s, Dr. Richard Mudd approached various presidents to include both Carter and Reagan. Both leaders joined Mudd and wrote letters saying they believed Dr. Samuel Mudd had been wrongly jailed. Nevertheless, the Army continues to hold fast to its position, and there is some justification, for there is now proof that Mudd may, in fact, have known Booth. 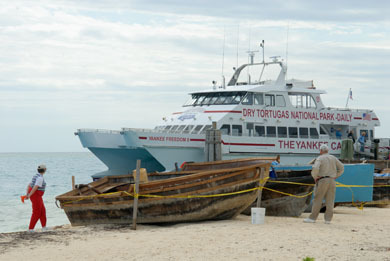 Twenty-four hours after our arrival, the Yankee Freedom was back reminding us that our time in the Tortugas was growing short, suggesting we had made a mistake by not staying for several nights, for the sights have only whetted our curiosity. Hurriedly we re-enter the Sally Port and climbed the spiral staircase for one last look over the islands, again stumbling across one of the Rodman smooth bore cannons. The cannon reminded us that the fort was never completed. About 1870 invention of the Parrot Rifle, with its lands and grooves and much greater penetrating power, rendered Fort Jefferson obsolete. Nevertheless the fort continued operational until 1873 at which time yellow fever struck again followed shortly thereafter by a hurricane. In 1874 the military departed the fort, and because of its almost unparalleled concentrations of bird species (described by John James Audubon who also visited here) the Tortugas became a wildlife sanctuary. Still, it wasn’t until 1935 when its ultimate purpose was officially declared. On January 4 President Roosevelt established the Dry Tortugas as part of the National Park System, obviously continuing with protection of the many species of birds attracted here. Certainly the park is one of the most remote, but because of that feature, it is also one of the most attractive, and we departed with considerable regret. Although these islands had seen much disease and disaster, now days, they’re washed more by the seas and by the sun, and their primary visitors remain the birds. 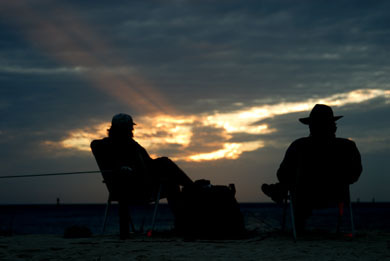 This entry was posted on Saturday, February 10th, 2007 at 8:24 am and is filed under National Lands, Travel. You can follow any responses to this entry through the RSS 2.0 feed. You can leave a response, or trackback from your own site. What a wonderful presentation of history. I really enjoy your escapades.